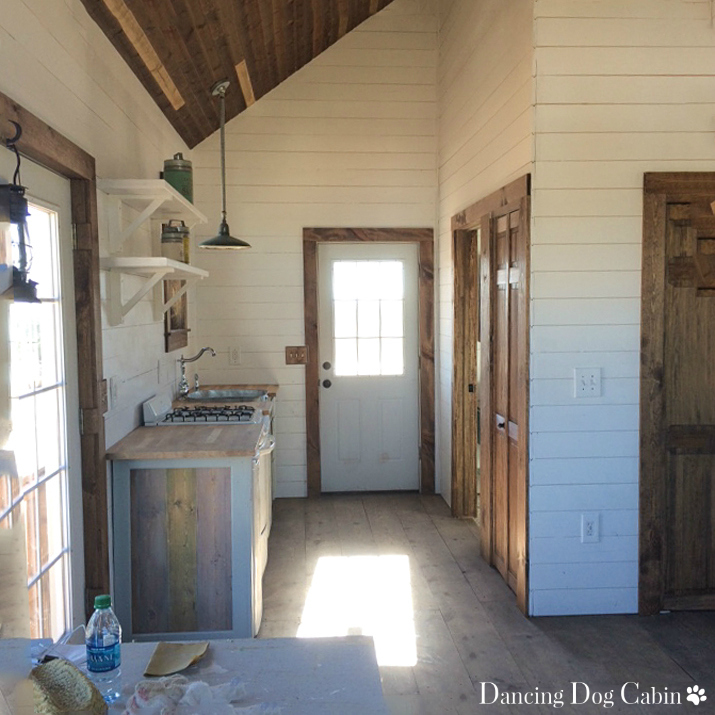 Dancing Dog Cabin: We Passed the Final Inspection! We Passed the Final Inspection! Over the past several months I've been mulling over how to start blogging again after having completely fallen off the blogging wagon last summer. So... 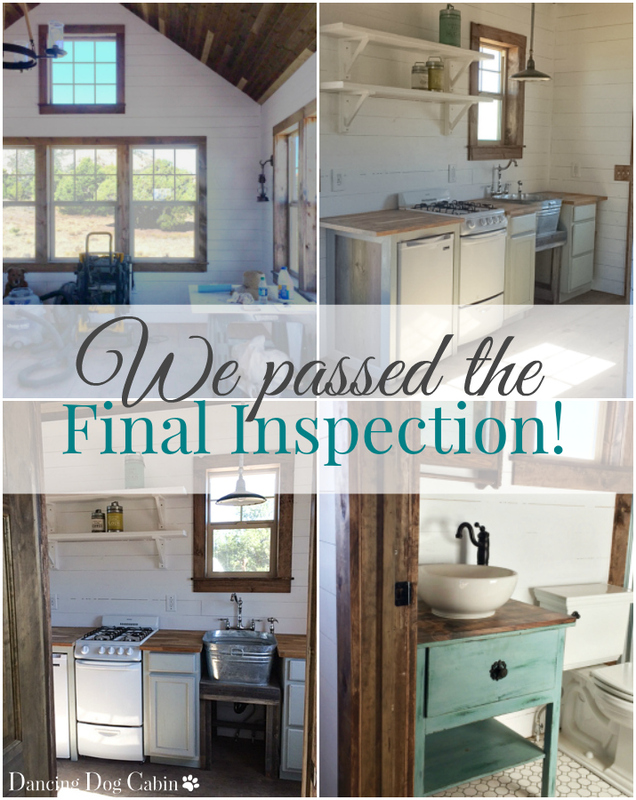 I'll just start by saying that we passed our final inspection! Last September. However, our joy at finally reaching this huge milestone was completely overshadowed by the fact that both my husband and I each lost someone dear to us last year. One of the last times I spoke with my mom was when I gave her a virtual tour of the cabin via my phone a few days before the final inspection. 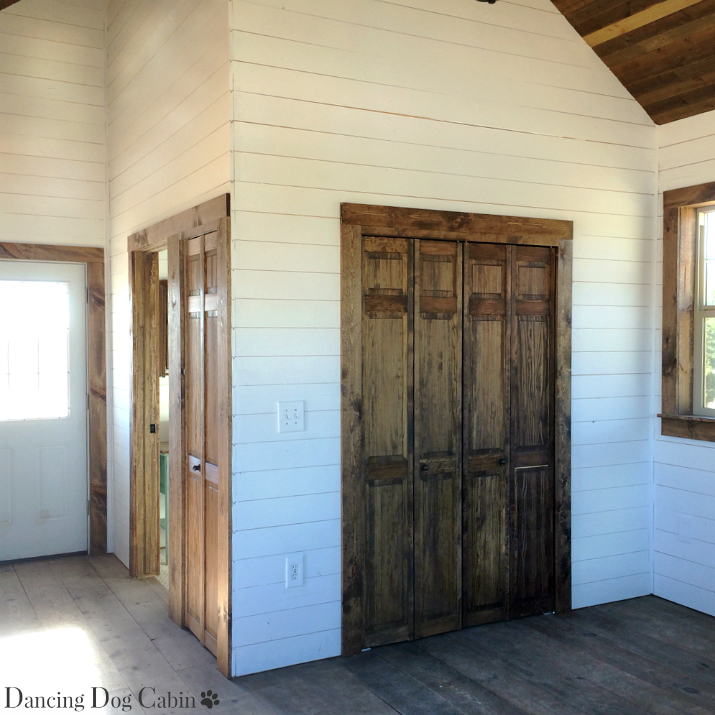 I had so hoped to show her the finished (even furnished) cabin in person. I took all these photos with my phone, so the quality isn't the greatest. I was too exhausted at the time to drag out my camera, the tripod, etc. and make the effort to get nice photos. Both my husband and I aren't talking about it, but we both know that the leaking bathroom sink has to be fixed. But fix it we will, because I love the way this looks. I suspect that the base is too thick for the hardware and that we should have installed the vessel sink directly onto the original table top, or removed the original top and installed the new one (and put the sink on that). I think my husband took this apart and re-assembled it a couple times, at least, in an effort to fix the leak. In the end he stuffed a bunch of paper towels underneath and prayed the inspector wouldn't catch it. By some miracle, the inspector didn't look at the sink at all and missed the fact that it leaks. 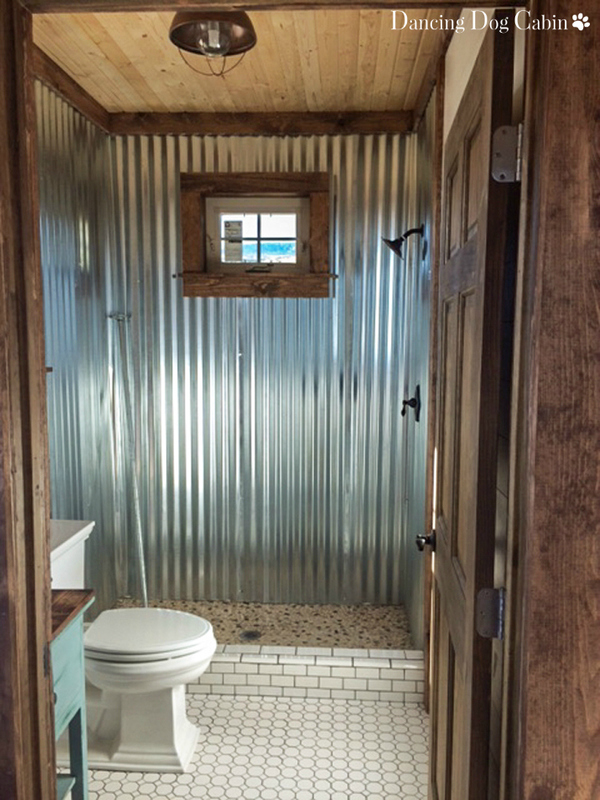 Installing the corrugated metal sheets as shower walls was definitely a seat-of-our-pants enterprise. I found lots of examples of showers finished with corrugated metal on the Internet (mostly Pinterest) but neither my husband or I could ever find any posts or videos that explained how to do it. I'm pretty thrilled with our mini pantry. My husband scoffed at the idea of having so much storage, but I've seen how he shops at the grocery store, so I know better... Plus, in our California home, we presently have every small kitchen appliance known to mankind, and I have no reason to expect things to be different at the cabin. The bi-fold doors are perfect for this small, constrained space. Still need a few finishing touches in the kitchen: cabinet hardware, more open shelves at the far end, perhaps some kind of rustic corbel under the counter overhang by the door. But it is a fully functioning kitchen (-ette) at this point. I was so worried that the inspector would ding us for not finishing this corner between the pantry and the closet. He didn't even look at it. Something else that still needs to be done however. 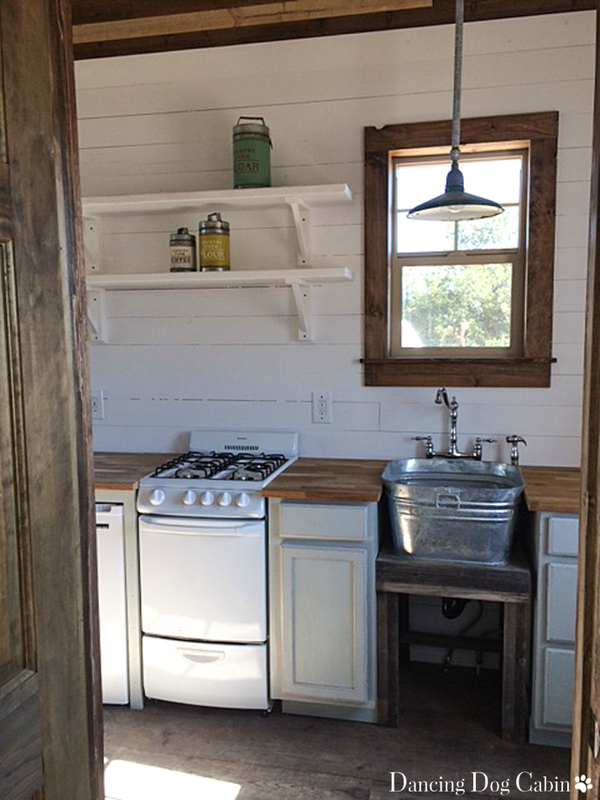 We installed the kitchen sink and its base first (making sure it was centered under the window) and then placed the cabinets and counter top afterward. Installing the kitchen faucet and butcher block counter around the tub/sink was harder than we ever dreamt. But my husband figured it out. And so far, it doesn't leak. There is R2-D2 (a.k.a. the big shop vacuum) lurking in the background, slyly waiting for the next opportunity to break more toes (I kicked it in a fit of irritation over paint colors a few years ago). I love the light and the views in this room. Yes, I know the switch plates are notched into the door casings. Thanks to an initial design boo-boo, we lost a few inches all around when we had to switch from 2x4 framing to 2x6 framing during construction to accommodate insulation that had the code-compliant R-factor. That meant that the extra wide door casings that I had originally included in the design now overlapped the switch plates. And we didn't catch this until after the electrician had roughed in the electrical. The other solution would have been to use narrow, dinky door and window casings. I hate narrow, dinky casings. 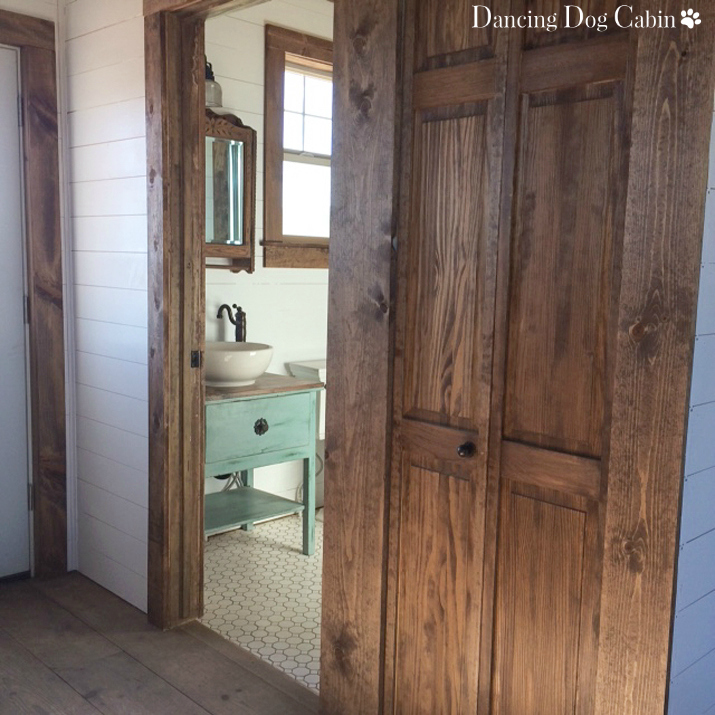 I had specifically designed the cabin to have beefy, rustic looking casings that would nicely offset all that white-painted tongue-and-groove panelling. So we have switch plates notched into the door casings. I'm calling it quirky. So, there it is. Finally a livable cabin. 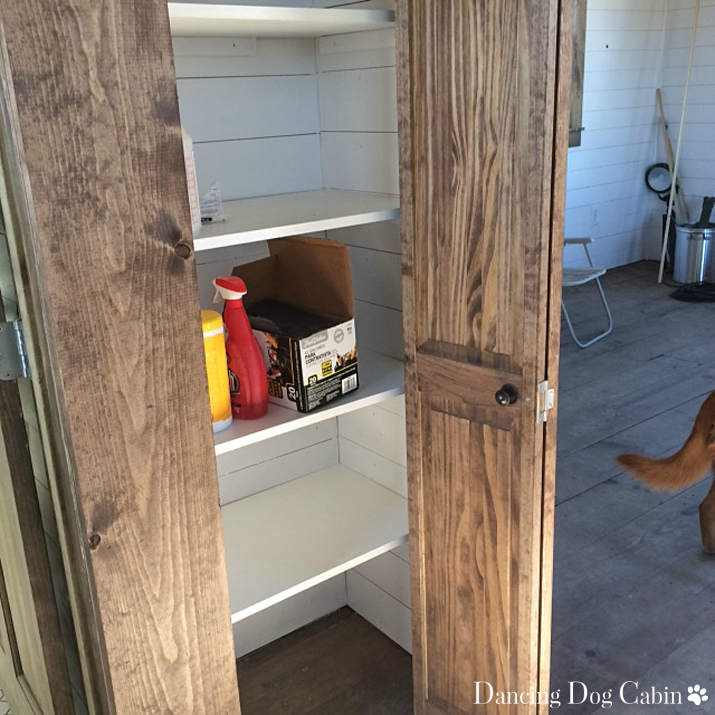 Next on the list is the few finishing touches, the deck (click here for my ideas on that), and, most importantly, furnishing it (click here and here for a look at some of the things that I plan on using in the cabin). 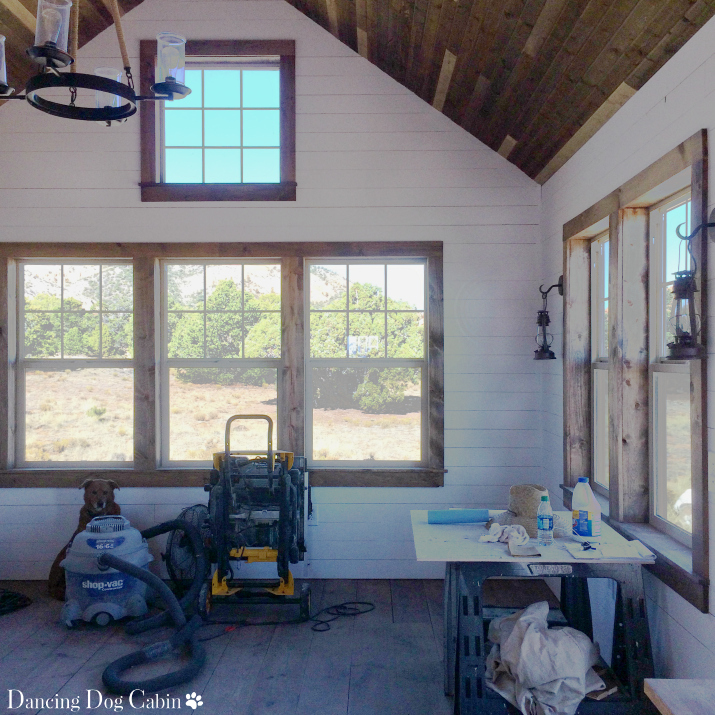 This post is dedicated to my mom, because, I owe, among many other things, my decorating style, my love of old vintage things and antiques with character, and my approach to creating a home to her and the home I grew up in. I need also to thank my wonderful husband. He did all the finish work inside himself and did an amazing job. So good to see you back in the blogging world, Melissa! I am so very sorry to hear about your mom. I'm sure she is looking down, and very proud of the beautiful cabin you and your husband have created! Thank you Amy, it feels really good to be back after being gone so long. 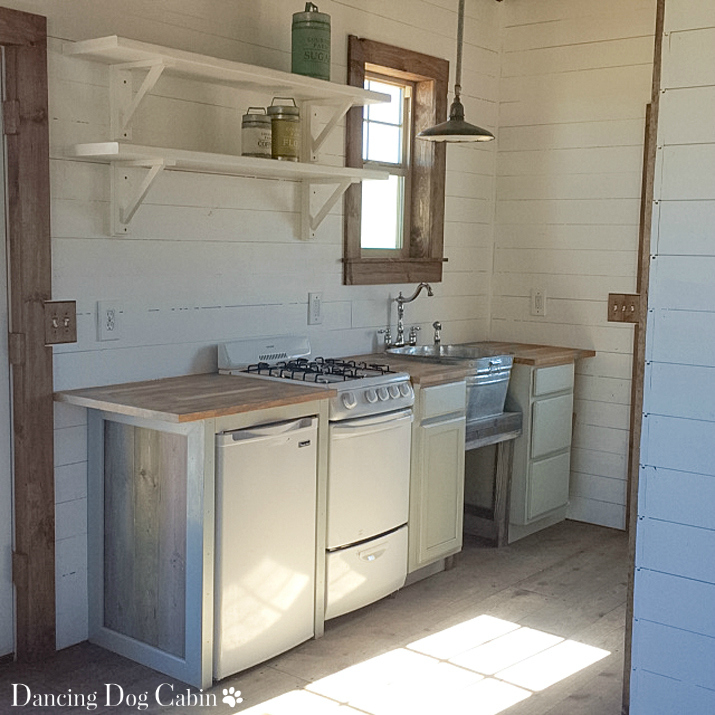 Wow!beaytifulpost!tribute to your Mom and the cabin is perfectly farmy and rustic! Beautiful job ! 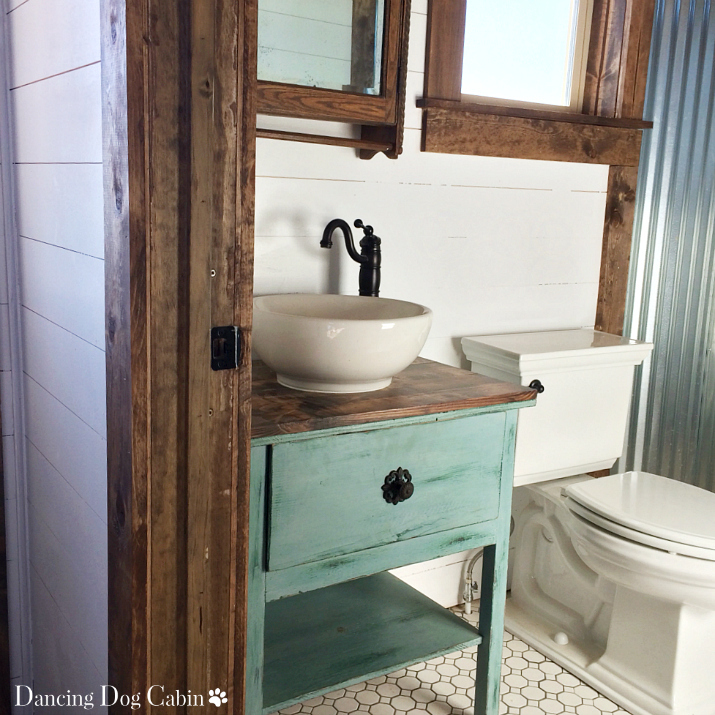 love the sinks and lantern light fixtures ! Enjoy it! Your Mother and mine ! Are with us in spirit ! My condolences to you for the loss of your mom Melissa. I think this beautiful cabin will always remain in your heart as a tribute to the special lady she was and all she has given you. Congrats on the inspection. I personally love all the quirks and that kitchen sink is so unique. Isn't that what our homes should be? Unique to us and for us. Melissa this heartfelt post is my feature at Sweet Inspiration Link Party. Congrats. Thank you Melissa. I ended up taking her blue Danish dishes and will likely use them in the cabin-- so more memories of her there. I am so sorry for your loss. I truly understand your feelings. I discovered your blog last year when I was researching ideas for our own cabin. We started building almost exactly one year ago. In July my younger brother was diagnosed with ALS, a horrible disease. The diagnosis took a terrible toll on my parents. My husband & I worked diligently all last summer and fall in between family obligations, making decent progress. My parents passed down several cherished family pieces to use in the cabin--the primitive table that my paternal grandparents set up housekeeping with in 1915 and a wonderful enameled cast iron sink. Christmas was bittersweet, my brother had a new granddaughter but couldn't hold her. I saw my parents on New Year's Eve and a few days later my father was gone. Died at the breakfast table. My family was and is devastated. My brother said that dad "was lucky" and his health rapidly declined. He passed away in March. The cabin was a refuge for my husband and I. We worked hard on it and cried that neither my dad or brother saw what we had been working on and accomplished. I love having the family items that have such a history and remembering all of the hours we have spent planning, working and yes, arguing over every detail. Your cabin is lovely and I hope that you and your family will enjoy it and make new memories there in the coming years. I also hope that time will heal both of our hearts. I don't have a blog, but if you would like to see pictures of our cabin you can follow me on Instagram-I am halliejane24. Hi Hallie, I'm so sorry for your double loss. Both my husband and I know very well how hard it is to carry on with your daily obligations when you are also dealing with family illness and loss. It sounds like you have some lovely family heirlooms to use in your new cabin. I plan on using several things that I inherited from my mom in the cabin- that way I'll have her there with me in a way. Beautifully done! I'm sure she's sharing it all with you and smiling all the way. Thank you! I know she is! 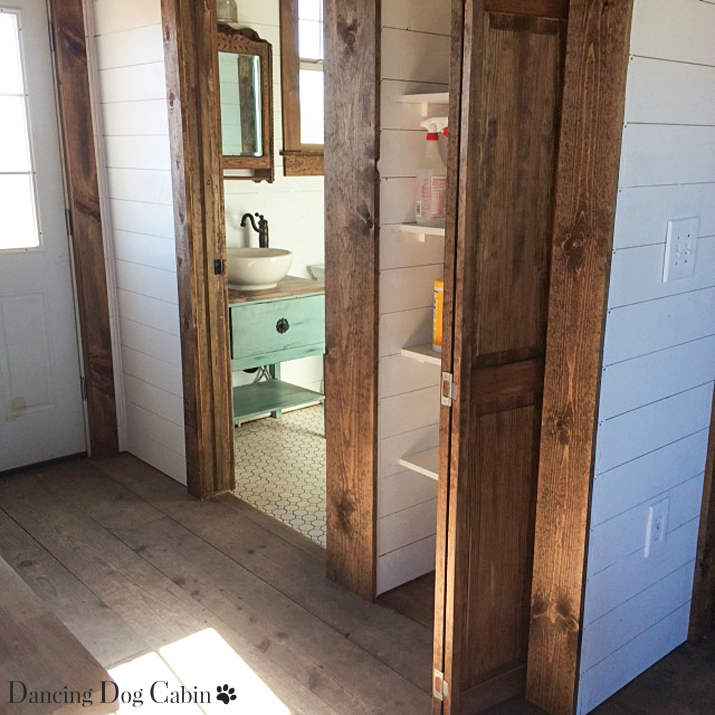 I love your sweet cabin...even the light switches notched into the trim (it works!). Your mom is surely smiling down at you. I'm so sorry for your loss. Our moms are special and their loss leaves a big hole. Thank you Cecilia. Yes, it's very hard to get used to the idea that I can no longer talk with my mom or ask for her input-- that's probably something no one ever completely comes to term with. I'm so sorry about the rough times and the passing of your mom. It's so hard to go through that loss. Your cabin is looking amazing! Great job. Looking forward to more posts from you. What an interesting and fun looking cabin. I am so sorry you have lost your mom and that your husband also lost someone. May God comfort both of you. I'm so very sorry for your loss! I'm sure wherever your Mom is now, she is very proud of your hard work and your beautiful cabin. I love it, is has so much heart and imagination. I love your kitchen sink! That picture of you and your mom is adorable, so sorry for your loss. Your house is beautiful and it has many lovely details. Oh no.... I'm so sorry, Melissa. About all the things you and your husband went through, but most especially the loss of your mom. No wonder you were gone so long. My heart goes out to you. Thank you for your kind words Rue. I guess our switch plates are original to the cabin too! Melissa, I'm so sorry for your loss. The cabin looks amazing and I know your mother would be proud. 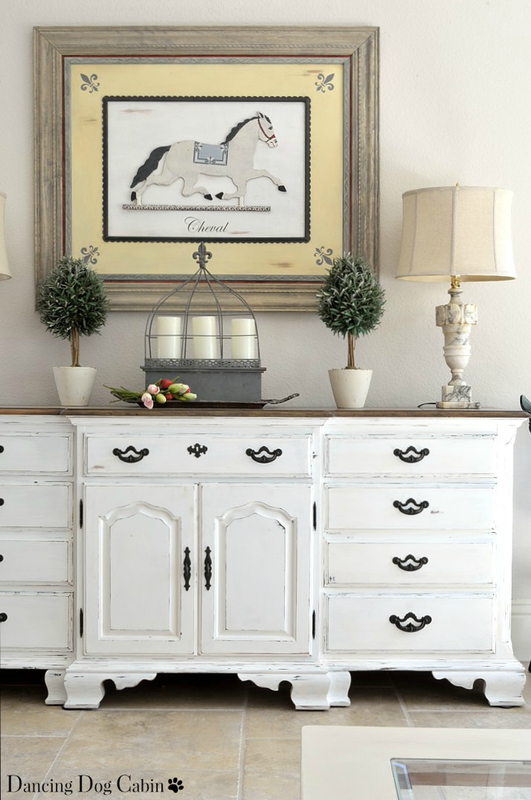 Thank you for sharing your home (& your heart) at Vintage Charm! Just wanted to let you know you are being featured at tomorrow's Vintage Charm party! So sorry for you loss! 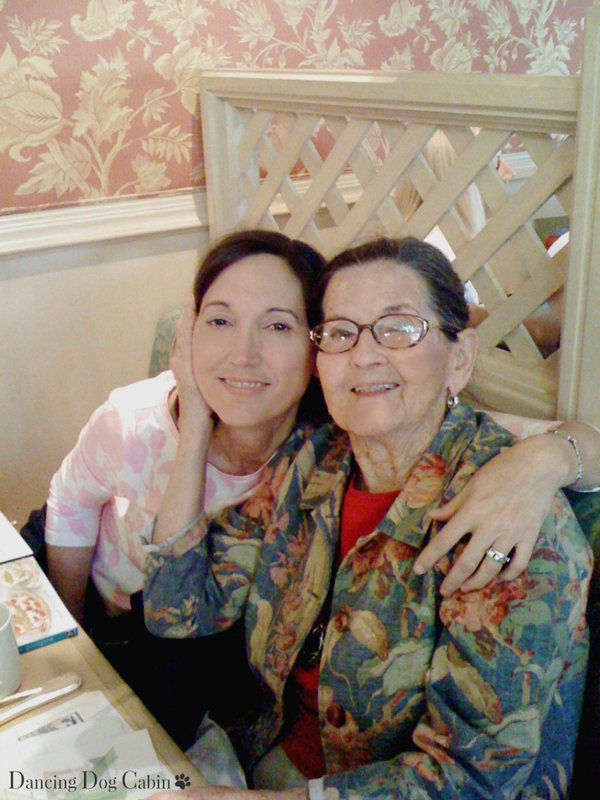 I'm going through health issues with my mom this year with her fractured pelvis and heart issues. So hard to see our moms sick and needing help. Then to top it off I break my foot and can't drive so my husband has to carry me to see her. Hopefully she will get to go home in a few weeks. Super cute cabin and I hope y'all can take the time to enjoy it. Thank you Kim. I'm sorry to hear about your mom and your foot. I know how difficult it is to be sick and worry about someone you care about as well. And I know how hard it is to move a parent into any kind of assisted living place or a home-- I hope that goes well for you and your family. Your cabin is beautiful!! I am positive your mama is looking down and smiling. Thank you Pamela! I'm sure she is too. Thank you Kathleen. I wouldn't say I have healed, it's more that I've tried to move on, as you say. I guess there is always an empty place in our hearts when our moms pass away. IN any case, you guys did wonderful with the cabin! It looks like a great getaway....and enjoy. Thank you Michelle. We are definitely looking forward to an actual vacation in the cabin.